How much Anatomy do Massage Therapists Need to Know? 1. Anatomy uses a scientific language which is not understood by most people unless they have studied the subject. Our video training courses are used by students from all over the world. For quite a few of them, English is not their first language. Complex anatomical terms would make it more difficult for those students to follow the training. Therefore we intentionally keep it simple. In other words, our online video courses are not exclusively targeted at massage therapists whose first language is English and who have studied anatomy and physiology. Trained and experienced massage therapists can easily apply their anatomical knowledge to our training on their own. 2. The Thai Healing Massage family of bodywork is based on the Asian style of massage therapy. Here in Thailand Thai Massage has traditionally never been taught based on anatomy and physiology since eastern medical models rely more on a knowledge of internal energy structure than the more clinical model of western massage styles. Asian bodywork uses less anatomical knowledge but more understanding of energy flow, whereas western massage has little understanding of energy flow but more anatomical knowledge. These are two quite different approaches. Here in Thailand you are taught where these internal energy lines run and how to work on them. Even excellent Thai therapists generally have little or no knowledge of names of bones and muscles since this is just not the primary approach of Asian massage. 3. Our students are encouraged to develop their feeling and their intuition, to learn how to use their hands as listening tools rather than as mere working tools, and to use their body, breath and energy in a harmonious way. While western massage styles generally use a more clinical approach to massage therapy, the eastern model focuses more on working with energy. At Thai Healing Massage Academy we encourage working through intuition and feeling rather than scientific knowledge. We teach our students to develop a highly refined sense of energy, and how to get great results when applying this to their massage. If students want to back up their training with detailed anatomical knowledge, they are encouraged to do so on their own, but this is not a strong focus of our training courses. It is certainly useful for massage therapists to have a good understanding of anatomy and physiology, but this does not necessarily make anyone a better therapist. Let me tell you a story. I know one excellent massage therapist here in Thailand. She has been working full time as a therapist for 16 years. She is very popular and in constant demand. Her clients love her and she is very effective. She is one of the best therapists here in Chiang Mai, Thailand. She has been working on princesses, movie stars, famous musicians, and has been flown all over the world by wealthy individuals just to get the benefit of her massage. But… she does not know the name of any muscles or bones and sees no reason to learn them. All she needs to know, she can feel with her hands. How do I know all that about her? Easy, she is my wife. I have been living in Thailand for many years and have received hundreds of massages. I am quite sure that almost none of all those therapists could name any muscle or bone in my body. The conclusion is that it is clearly possible to give a great massage without anatomical knowledge. I did study anatomy and I keep several anatomy books on hand. However I did not learn any of this in the several massage schools which I attended originally here in Thailand. But I did learn about good ergonomics, energy flow, state of mind, loving kindness, and healing intentions. In all my years as a professional massage therapist I have yet to meet one single client who asked me for solid scientific proof of the effects or benefits of my massage. Instead they all just wanted to feel better, and they were happy that I could deliver that. So if the clients don’t care – who does? Here in Thailand therapists see no need to cater to the western craving for scientific validation, double blind studies and analysis of chemical reactions in the body. Their purpose is to make their clients feel better and get better. Anatomy and scientific research are a good source of supporting information for massage therapists, but they are not necessarily a prerequisite for a good massage. Ideally the anatomical and scientific knowledge would go hand in hand with the Asian energetic model. But to get the priorities straight, it is possible to be an excellent massage therapist without anatomical knowledge. However it is not possible to be a great massage therapist just based on anatomical and scientific knowledge. Which choice would you make to get a good massage? The eastern and western models are not mutually exclusive, and can make an ideal combination. But let’s just imagine you had to make a choice. You really want a good massage and have only two options. One is an experienced massage therapist who is an expert in anatomy, physiology and scientific research, but does not have that special touch that makes you feel great. The other one is an experienced massage therapist with a wonderful magical touch that makes you feel like you just went to massage heaven – but he or she has no idea about anatomy, physiology or science. Which one would you pick? What is the true spirit of massage? My aim is not to invalidate anatomy. 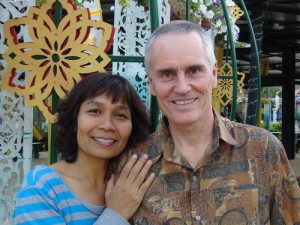 My only purpose is to point out the priorities which I have learned based on many years of experience with practicing and teaching Thai Massage therapy in an Asian environment. I have found that the eastern model has a higher chance of producing a wonderful massage experience and also therapeutic results. After all, massage is called a “Healing Art” and not something like the “Clinical science of effective tissue manipulation”. I feel that the eastern model is closer to the actual spirit of massage therapy. It encourages the heart and spirit to be involved. It promotes feeling without engaging the mind unnecessarily. It is a way for the therapist to develop higher states of consciousness and develop attitudes like love, kindness, and empathy. It enables you to create a way of life through your massage therapy instead of just a job. The author, Shama Kern has been practicing and teaching Thai Massage for 16 years. He is the founder and director of Thai Healing Massage Academy and the creator of 20 online Thai Massage video training courses. As a Anato-nut knowing anatomy really well I will say it is helpful to know locations & rotations but personally my most memorable massages are the Thai style. Shama has done such a great job of creating these courses most people will figure it out with time and experience. Thanks Brenda, I appreciate your input! Thank you Shama! Your wife sounds amazing. Having a treatment from her is definitely on my list of top things to do in this lifetime! Do you guys do onsite training together?-that would be awesome- and do you have a schedule/dates for your onsite courses? We have not been doing much onsite teaching recently since I put a huge amount of energy this year into producing my video courses. In 2011 I came out with ‘Complete Thai Massage’, ‘Heavenly Head Massage’, ‘Thai Rocking Massage’, ‘Abdominal Massage’, six specific ‘therapy courses’, and just now ‘Magic Touch Secrets For Massage’ – quite an amazing collection. That’s around 40 hours of finished video sessions, including hundreds of hours of recording, editing, processing and website building. This has occupied a large amount of my time. Plus I am doing regular massage sessions as well. I have two more video courses that I am working on, and when that is all done I can think about scheduling more live trainings. In the back of my mind I am thinking that I would love to do a training tour through various countries with my wife. Thank you for good information……….Shama, you best, man. Thanks for your comment Donna. This is indeed a place where many wonderful healing artists and therapists leave comments and insights, and I am very happy about that. Apparently you fit right in. Welcome to the community Donna! Hi Kei, thank you for your kind invitation. Let’s stay in touch about that!